When Robert Toomer graduated from LSU in 1995, he had a decision to make. Would he continue his football career in the Canadian Football League (CFL), or enter the coaching profession. Toomer had a young family at the time and although he still had a passion to play the game, he knew it was in his and his family’s best interest to put up the pads and grab a whistle. Toomer served as a graduate assistant at LSU before taking a job at Jesuit High School in New Orleans in 1998. In 2001, he moved to Houston and served on the staff at Galena Park High School before moving back to Louisiana in 2006 to become the head football coach/athletic director at Abbeville High School. In 2008, he moved back to Houston and was named defensive coordinator/linebackers coach at Bush High School. 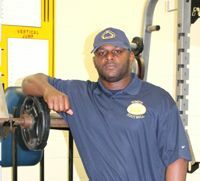 In February of 2009, he was named the head football coach/athletic coordinator at Nimitz High School. The program struggled the first couple of years, but in his third season he led the Cougars to a late run that produced a playoff berth. He followed that up with a 7-3 season in 2012 and a second straight trip to the playoffs thanks to a three-game winning streak to close out the season. For the first time in almost a decade, Nimitz defeated all three Aldine ISD teams en route to their second straight post-season berth under Toomer’s direction. For that effort, Toomer was named the Northeast News’ Coach of the Year. Toomer admitted the first couple of seasons were tough, but he and his staff stuck to their plan and now believe they are headed in the right direction. This season, Toomer had the chance to coach his own son, senior fullback Trey Toomer. He said it was special to coach his son, but he also knew his son had to earn his time on the field. The younger Toomer did just that as he rushed for 607 yards and scored 13 touchdowns. He added coaching ones son is rewarding, but it can also be difficult. The elder Toomer knows a thing or two about running the football. He was an accomplished high school player at Sylvester, GA. So accomplished in fact that he broke Herschel Walker’s career rushing record in the State of Georgia by rushing for more than 8,000 yards while scoring 105 touchdowns. Toomer’s record has since been broken. Not only did Toomer leave his name in the Georgia record books, he also made a splash nationally and is still second all-time in the number of carries nationally with 1,200. His stellar high school career earned him a scholarship to LSU where he enjoyed success early, but a torn PCL forced him to the bench and opened the doors for Kevin Faulk to take his place. Faulk went on to have a long and successful career with the New England Patriots, winning three Super Bowl titles as a member of the Patriots. Looking back, Toomer knows he made the right career decision and is looking for bigger and better things for the program, and all sports at Nimitz. Looking back at it, that torn PCL may have been a blessing in disguise for Robert Toomer. It set him on the coaching path and that’s been a good thing for him and the Nimitz Cougars. 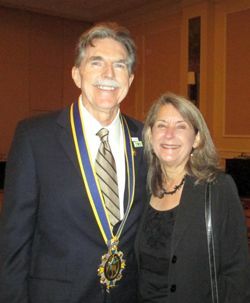 GREENSPOINT – A surprise visit by former Houston Mayor Kathy Whitmire was one of several highlights of the Greenspoint District’s recent reception honoring its 2012 partners and volunteers, and acknowledging the career and pending retirement of District President Jack Drake. Digital Realty Trust was named Greenspoint’s 2012 Company of the Year for its continued investment in the area. Owner of the Greenspoint Data Park at I-45 North and the Sam Houston Parkway, Digital Realty Trust is in the midst of a two-phase redevelopment including construction of two purpose-built high-efficiency, high-performance computing data centers totaling nearly 138,000 square feet. Greenspoint Volunteer of the Year was James Curry of Hines. Chairman of the Greenspoint District Board of Directors, Curry was recognized for his dedication to the district, demonstrated in the time and expertise he freely gives toward representing Greenspoint. The Greenspoint Property Owners Association earned Partner of the Year honors for its development of a public plaza to showcase a signature piece of public art commissioned by the Greenspoint Redevelopment Authority. Titled “Paper Plane,” and due to be installed in early 2013, the sculpture is an origami-style plane rising 15 feet above the ground. Mexico City Attorney Manuel Moctezuma of Chalela, Enriquez y Moctezuma, S.C. was named International Partner of the Year. Moctezuma is a member of the Greenspoint District International Economic Development Advisory Council, and he travels regularly from Mexico City for Advisory Council meetings. In 2012, he was instrumental in helping organize a Greenspoint trade mission to Mexico, and he provided introductions to attorneys in other countries who assisted in other district trade missions. Following the awards, several speakers, starting with Whitmire, acknowledged retiring President Drake for his contributions to the community. Before taking on the assignment of gathering support to create the Greenspoint District, Drake served as assistant to Mayor Whitmire, Houston’s mayor from 1982-1992. Drake recruited department heads and managed Whitmire’s support staff for the first four years of her administration. Others acknowledging Drake included Harris County Sheriff Adrian Garcia, Metro President George Greanias, Greenspoint business owner and volunteer Margaret Eyster of Magoo’s Print Shop, and Ray Laughter, Vice Chancellor of External Affairs for the Lone Star College System. A City of Houston proclamation, presented on behalf of Mayor Annise Parker by District B Council Member Jerry Davis. A State of Texas proclamation, presented on behalf of Rep. Armando Walle by Sylvia Garcia. A US Congressional proclamation, presented on behalf of Congressman Gene Green by George Maldonado. Another highlight of the evening was the ceremonial transition of leadership of the district from Drake to Jerry Lowry, who the Board recently named as Drake’s replacement. A 13-year employee of the Greenspoint District, Lowry is currently executive vice president and chief operating officer. He will officially become president when Drake departs January 15, 2013. Earlier in the day, at a meeting of the district’s Board of Directors, service awards were presented to four board members. Recognized for five years of service to the board was Dr. Wei Huang of American Bureau of Shipping. Earning recognition for having completed one year of service to the board were Grace Cervin of AGS Professional Services, Ed Hinton of High Mount Exploration & Production and Dave Egbert of Exterran Energy Solutions. 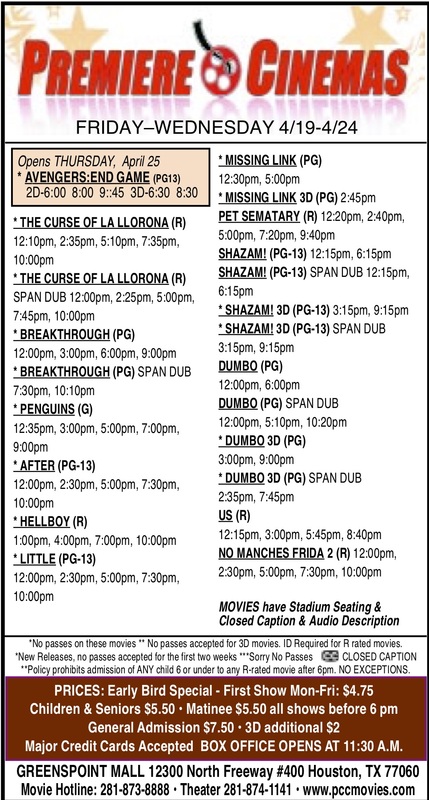 AUSTIN – Gov. Rick Perry set Saturday, Jan. 26, 2013, as the special election date to fill the Texas State Senate District 6 seat formerly held by the late Sen. Mario Gallegos. Candidates for this special election must file applications with the Secretary of State no later than 5:00 p.m. on Dec. 27, 2012. The early voting period runs from Wednesday, January 9 to Tuesday, January 22. The winner will serve a four year term beginning in 2013. Gallegos died of liver disease on October 16, 2012 at the age of 62. This was too late to remove his name from the ballot, and he received the most votes for the position. Declared candidates for the seat include former county commissioner Sylvia Garcia, state representative Carol Alvarado, and previous Republican candidate R. W. Bray. Also a possible fourth candidate is League City resident Rodolfo Reyes. The legislature will meet in Austin for a six month session, starting on January 8th. Many serious issues must be resolved and voted on, including education budgets, transportation planning and funding, economic opportunities, and healthcare plans. The two democratic candidates have already started their campaigns to the public, with statements about their positions on key issues. Garcia has issued several papers criticizing the Governor for not deciding on an election date. Even now that the date is set, she said the decision is “bittersweet.” “Governor Perry’s delay in his decision means our communities will have no voice in Austin for nearly 10 percent of the 2013 session.” “Make no mistake, this session will begin with an empty seat for Senate District 6 at a time when we will see battles over our children’s education, expanding Medicaid to bring quality healthcare to our families, and fighting for good jobs in the Houston area.” She went on to say it was important to elect a senator with the courage and integrity to stand up to Rick Perry. “In just a few weeks, the Texas Legislature will convene with serious issues facing our state – restoring funding to our public schools, creating good jobs and economic opportunity, making college affordable and protecting our senior citizens,” she said. The Aldine Education Foundation (AEF) “Surprize Grant Patrol” made their presence felt loud and clear when they arrived at five Aldine ISD schools on Friday, Dec. 7 to award AEF’s first-ever teacher’s grants. Using tambourines and noisemakers, the “Surprize Grant Patrol” descended on Eisenhower High School, MacArthur Ninth Grade School, Thompson Elementary School, Wilson Intermediate School and Shotwell Middle School to deliver grants totaling $6,555. The first stop was at MacArthur Ninth Grade School where physical education teachers Cathy Roach, Ermid Benitez and Jeremy Broadway received a $2,952 AEF grant to fund their “Biggest Loser” competition. 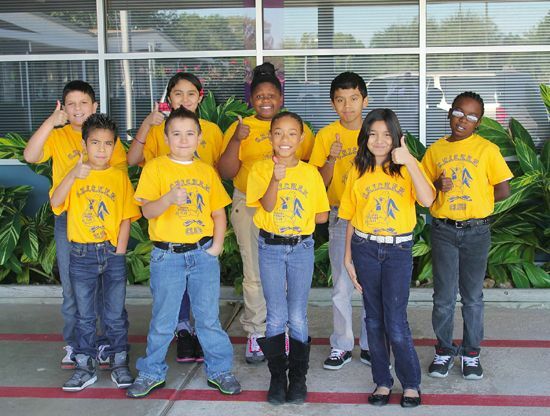 The “Biggest Loser” competition will serve as the monitoring tool where MacArthur Ninth students will see visible changes and manage their fitness goals. Next it was on to Thompson Elementary School where teachers Teana Cardin, Nabil Mahboubi and Kelly Sadler received a $603 grant to create an outdoor classroom that will include a human sundial, an interactive clock and a weather station to incorporate math and science TEKS in a hands-on environment. 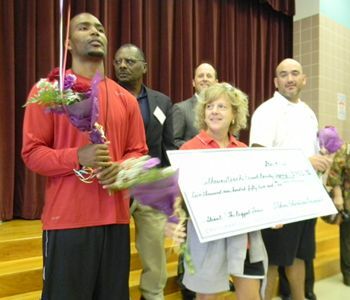 The AEF noisemakers then headed to Wilson Intermediate School where they delivered a $1,000 grant to teacher Clarissa Taylor. The grant will provide funding for Taylor’s program to increase student literacy and achievement in reading through the implementation of e-readers in small-group workstations within her ELA classroom. The next stop was Shotwell Middle School where music teacher Michelle Womack received a $1,000 grant that will help her to form the first madrigal singing group in Aldine ISD. While at Shotwell, Womack’s choir students performed for AEF members. The final stop of the day was at Eisenhower High School where teacher Michaelann Kelley received a $1,000 grant to fund her program of giving her art students their own artistic voices by taking them on field trips to museums, and art galleries during the spring semester. The teachers who received the grants had to submit proposals to AEF’s Program Committee, which is chaired by former Aldine ISD Superintendent Nadine Kujawa. Other members of the committee are Rose Avalos, Sidney Brewer, Richard Cantu, Jeff Hartman and Jocklynn Keville. Mrs. Kujawa said it was exciting for the AEF to finally provide grants to Aldine teachers so they can continue to provide innovative program for their respective students. Joining Mrs. Kujawa on the “Surprize Grant Patrol” were AEF Board Members Dr. Wanda Bamberg, Patti Acosta, Shane Clouteaux, Rose Avalos, and John Cornett. Aldine ISD Trustees who also took part in the grant presentations were Dr. Alton Smith and Marine Jones. Accompanying the “Surprize Grant Patrol” on behalf of the district were Ben Wilson, Dr. Linda Rodriguez, Todd Davis, and Stacey Smith. For more information on the AEF, or to make a donation, call (281) 985-6078 or visit www.aldineeducationfoundation.org. Representatives Farrar, Hernandez-Luna and Walle said they need a fighter like Sylvia Garcia with them at the Capitol. “Public education has been cut by 5.4 billion dollars. I want my son to have the opportunities I did not have and that will not happen without a strong leader to take on Governor Perry’s attack on public education,” said Representative Walle. 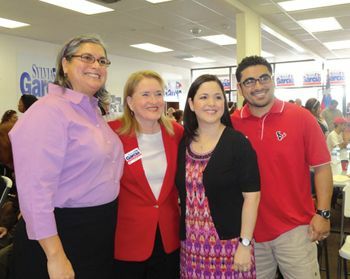 Representative Hernandez- Luna said the only way to stop Governor Perry‘s opposition to President Obama’s health care law, is to have Sylvia Garcia on the floor of the Texas Senate. With members of labor, TOP and residents from all over the district crowded into the head quarters, Luna reminded everyone that up to 400,000 Harris County residents could be denied health insurance. After the speeches ended with the crowd chanting, Fired-up and Ready to go, teams of volunteers hit the streets to knock on doors and talk to the voters of District 6. NORTH FOREST – New and returning school board members were sworn into office last Monday night, Nov. 19th, and officers were elected for the coming year. The evening started with an award to retiring board member Albert Coleman, presented by Lois Edwards and Superintendent Forté. The election votes were “canvassed,” a formal process that indicated and certified the number of votes cast in the board election. Results indicated that in Position 4, Thaddeus Seals running unopposed received 7559 votes. In Position 5 there were three candidates. Linda Bell Robinson received 6081 votes, Albert Coleman 3621, and JoAnne Love Casey received 1309 votes. The new board members were individually sworn into office by judicial officials. Thaddeus Seals was sworn by Judge Mike Parrott, and Linda Bell Robinson was sworn by Judge Zinetta Burney. Judge Parrott teaches a Teen Court in the District, and Judge Burney was at one time an attorney representing the District. After being sworn to office, the new board acted to elect officers for the coming year. 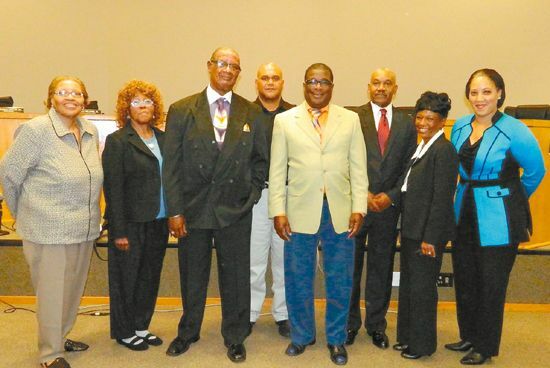 For Board President, Charles Taylor, Sr. was elected by the board members. For Vice President, Thaddeus Seals. For Secretary, Linda Bell Robinson, and for Assistant Secretary Henry McGowen. In accepting the presidency, Pastor Taylor said “It is a challenge I take not lightly,” and referred to the challenges still to be resolved in the District in the next year.